Chew Your Way to a Healthy Holiday! Drink, too! I sure hope your holiday season is off to a good start! I’m not sure what a hack is, but I think it is the new term for a tip! I do know I am a health hacker! I am so amazed how these simple habits will improve how your body functions.. and while like any other healthy habit it takes some focus and commitment, the rewards are going to be life long and amazing. These may be much easier than giving up your treats! I have a whole new E-Book coming out soon, and this is just a mini-kind-of-abreviated version. There is also a new edition of Fly Healthy too! So, my #1 Health Hack Tip for you, and its a major one, is to stay hydrated. Staying hydrated isn’t always as straight forward as it sounds, like just drink 8 – 8 ounce glasses of water. Today, we must specific, pure water. In fact, even pure water isn’t going to be hydrating for every one. Some people are chronically dehydrated. Its like a dried out plant that you water, but the water all runs through and out the bottom. So, how do you be sure to soak your soil? Sure, drink plenty of water, but put something in that water to help you absorb and integrate it into your system. There are several ways to do this. One way is to drink lemon water. You can make it easier on yourself, by making lemon juice and freezing it into tiny ice cubes. Then when you fill your glass you just throw in the tiny icy lemon juice cube. You know its better to drink water at body temperature, so lemon tea would actually be perfect. Some other suggestions, as to add a pinch to salt to your glass of water. Once again, pure water, and also pure salt. I have deeply hydrated myself this way, by using a very special and potent salt. In fact, it could be a gift to yourself and your family to purchase this salt for the holidays. This is the only salt I will use. I generally do not use salt, but if you aren’t well hydrated and your are drinking at least half your body weight in ounces of water (100 pounds of weight, 50 ounces of water) per day, and still having dry skin, dry lips, fatigue, brain fog, etc.. then try this! If you have a hard time drinking all this water, then take your water containers and fill them all in the morning, or the night before. You can add a few drops of organic edible essential oil to flavor them, or a few springs of fresh mint, rosemary or lavender. Make fresh herbal tea, I love a medicinal herbal tea myself. Then be sure to drink them all during the day, between meals, and at least 2 hours before bedtime! Yes, you’ll probably pee more! That’s good! Peeing is getting rid of toxins. Drinking that big glass of lemon water in the morning, is like a shower for your insides! Personally, I always add my Wild Algae to my 2nd glass of water in the morning. I still feel the substantial nutrition there. Staying well hydrated can actually help you feel better, look better and gain less weight during the holidays. So, please… put in the effort to upgrade your hydrating now.. and continue into the future, well-hydrated! I do have links to whole house water systems, a good distiller, and such, if you want to add that to your healthy household this holiday. 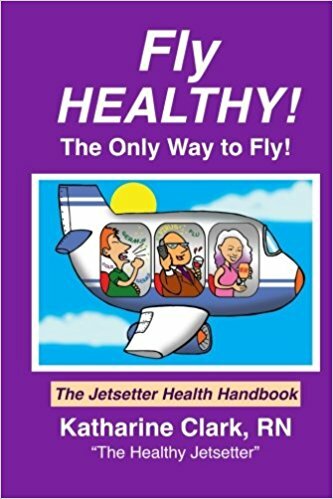 Right now if you order the latest edition of Fly Healthy, The Jetsetter Health Handbook, I will autograph it and send it to you free, with a discount coupon on the Air Tamer. You can email or pm me,, and pay by PayPal. I am traveling in a few days, so this is only on offer til Dec.13. Check out Air Tamer. I use the AirTamer when I fly to purify all the air around me. Its also great if you’re in the fires, or driving in an congested area with bad air, like a city. They are also on sale now, and you can combine my coupon with the sale if you want. Fly Healthy! The Jetsetter Health Handbook. How to stay healthy when you fly! Qigong is the way I meditate and work out. Qigong came to mind quickly after diet. I’ve been to China several times on qigong study tours with my teachers, Daisy Lee and Francisco Garripoli. Merlin, a friend in Kauai, introduced me to “Transforming Stress into Vitality” by Mantak Chia in 1980. This was the first book I read and it changed my life to learn and start practicing Qigong. I kept practicing Qigong because it improves my mental physical, spiritual and emotional health. Basically qigong is a way of helping you gain more awareness of the energy flow between you and nature. It is more than exercise, it is also meditation. The focus on coordinating the breath and movement, while stilling the mind and sinking into the earth is very stabilizing and increases your life force, concentration, circulation, immunity and much more. There are thousands upon thousands of kinds of qigong and ways to practice. I’ve practiced many. You can do standing poses, moving from your core to the rhythm of our breath or you can sit or lay down completely still and simply visualize your energy flowing with your breath. I think once you get a few of the basics, like the stance, flow and focus, you will find a rhythm of your own with your qigong. cycles of life, the rhythms of nature, the forces of the elements. I love to do my qigong facing the sun, feet planted on the earth. Qigong has really helped me improve my mental physical and spiritual health. Its so simple and easy to do I high recommend it. it is well worth the time spent to practice qigong because the rewards in your increase in vitality and ability to handle stress and create healing for yourself is unlimited. Because of having low thyroid, I was always cold natured. I hated cold weather. After practicing Qigong for 10 years, I no longer am cold natured. I can always be comfortable in normal temperatures. This I attribute directly to my qigong practice. You already know this. That you know is not enough. Act! Practice! Get out and enjoy yourself in nature! How many times have you hear someone say, you can live a month without food, a week without water, but only 8 minutes without oxygen? Not only do you need air, but you need air with oxygen! Stale polluted indoor air is simply not the same as fresh air. Fresh air is made up of a number of different gasses with oxygen and nitrogen being the most abundant ones. Fresh air is full of negative ions, it has a good amount of oxygen. An ocean breeze or the air beside a waterfall is even more healing! Actually the amount of oxygen at sea level is decreasing. Often the aire feels much more refreshing above 1000 feet elevation. Nature’s smells are natural aromatherapy. Getting outside into fresh air, smelling the grass, trees, and flowers reconnects us to the memories of other times in nature and enhances the healing that being in nature provides. Houseplants indoors can dramatically help you improve the quality of your indoor air. There are excellent indoor air treatments, such as Aranizer, however unless you live in a very polluted city by the highway or some industry smokestack, your outdoor air is probably better than treated indoor air. I love to sleep with my window open next to my bed. Get out in nature where you have the full spectrum of light and color. Colors are certain wavelengths of electro-magnetic energy seen through our eyes. being interpreted as colors by your brain. The color we see is the part of the visible spectrum that is reflected back by a certain object. also stimulates the brain to become more active and more intelligent. “In the near future, we shall become the next race of men/women. AT that time we shall operate upon mental energy, magnetic energy, sun energy. Scalpels and chemical agents will no longer be necessary.” The Tibetan, Alice Bailey’s teacher. Color Therapy, now called Chromotherapy, was written about as early at The Canon of Medicine written by the muslim scientist and physician Avicenna in 1025. You know how enjoyable it is to see a field of colorful flowers. Its doing more good than simple relaxation for your body. Just get out into nature and observe the variety of colors and notice how you enjoy them all.